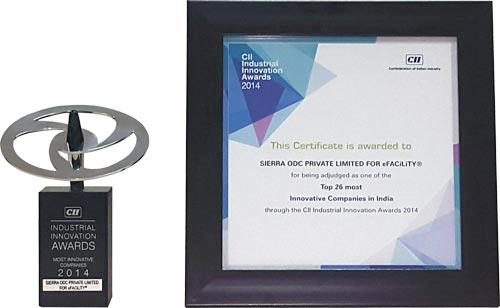 SIERRA is happy to announce being awarded as one of the Top 26 most innovative companies in India at the CII Industrial Innovation Awards 2014 for the innovations implemented in eFACiLiTY® - Enterprise Facility Management System. This CII Award recognizes an enterprise for excellence in building and delivering innovative solutions. SIERRA was awarded for its innovative solution eFACiLiTY® that integrates with Building Automation Control Systems (BMS/BAS) and provides innovative automation capabilities at the hands of the building users creating highly smart buildings that are fully automated, energy efficient and user friendly. CII Industrial Innovation Award is the recognition & celebration of innovative Indian enterprises for excellence in building and delivering innovative solutions across various industry segments. Announced at the Knowledgexpo at India Expo Centre, Greater Noida, and selected by leading industry influencers and CII executives from among hundreds of nominations; this premier award seeks to recognize and honour Indian Industry's brightest stars and to encourage innovation and business growth without being judgmental about the kind and nature of innovation. The assessment process for the CII Industrial Innovation Awards 2014 was a rigorous five-stage funnel process that involved several months of rigorous and comprehensive assessment steered by an eminent team of jury members comprising of top innovation experts chosen from the world of academia and consulting with established credentials, which included eminent scientists from ISRO, IISc, TIFAC and Directors & Professors of Imperial College London, IIM's, IIT's, London Business School, MIT, Cornel and Washington University. "Awards and recognition play an important role in encouraging innovation. The government has been giving awards for several years now, but with a focus on technological innovation. While these government awards were decided by eminent juries, they lacked an in-depth assessment process. But, in areas like quality (think of the Malcolm Baldridge or equivalent awards), an important part of the selection process is the in-depth assessment carried out by qualified assessors. So, when CII decided, after several years of internal debate, to institute industrial innovation awards this year, such an assessment became an integral part of the process." – Mr. Rishikesha T Krishnan, Director Indian Institute of Management, Indore. Our CEO & Managing Director, Mr. Giridhar JG and Head – Global Sales, Mr. Girish Krishnan were bestowed with the honour of receiving the accolade on behalf of SIERRA. The award was presented by Mr. R. Ramaraj, Co-Chair, CII Innovation & Entrepreneurship Council in the presence of dignitaries Mr. S. Gopalakrishnan - Immediate Past President, CII Chairman, CII Innovation & Entrepreneurship Council, and Cofounder and Former Vice Chairman, Infosys Ltd.; Mr. H. K. Mittal - Adviser & Head National S&T Entrepreneurship Development Board; Mr. Satyajeet Rajan, IAS - Principal Secretary (Industries), Government of Kerala and Managing Director, Kerala State Industrial Development Corporation Ltd. and Dr. Renu Swarup - Advisor, Department of Biotechnology and Managing Director, Biotechnology Industry Research Assistance Council (BIRAC). We thank the eminent jury and CII for this premier recognition. We also thank our clients and partners for supporting us in our progress all these years. "SIERRA is honoured to have been named as one of the top 26 innovative companies - especially when recognized by the Confederation of Indian Industry and this gives us great motivation and confidence to take eFACiLiTY® to be the world's best Facility Management Software and SIERRA to be accepted as a world-class software services company" said Giridhar JG. eFACiLiTY® is an Enterprise-grade Facilities Management Software developed, owned and supported by SIERRA ODC Private Limited, a two-decade year old Software company operating in India with offices in USA, Malaysia and the Middle East. SIERRA, a Microsoft Gold-Certified partner is committed to provide world-class Software services and solutions to customers across the globe. SIERRA strives to offer the best long-term value with precision ,quality, and on-time to all our customers, partners, re-sellers and employees.